The cloud-based telephone system managed by ACT Systems. Today, many things are stored in the cloud as a matter of course. There we store our data, share our music and edit documents in real time together. Only the good old telephone system remains hidden somewhere in a dark corner in many businesses. The solution: Cloud-based telephone system managed by ACT Systems you will always be up-to date with business communication. Our cloud-based solution, made in Germany, guarantees optimal voice quality and failure protection. The perfect telephone system for 2 to 249,000 employees. In almost any industry the demands for flexibility are increasing: newly opened branches, a project that requires 10 new employees from one day to the next, expansion into other countries, and so on. You will always be able to perform, whether your company is planning for 2 or 249,000 employees. ACT Systems can make quick adjustments to extensions and other communication needs is no longer a problem and very easy to achieve. It’s often said that new technology is out of date the moment it’s purchased so to prevent this we provide you with regular new updates for life completely free of charge. This means your new telephone system is always kept up-to-date, no matter what is happening in the market. Do you have to give up any features with our cloud solution that you might be used to from your conventional system? Quite the opposite. You have 150 intelligent features to choose from, which are always improved as the technology evolves. To introduce all of these 150 features here would burst this brochure. For this reason we are only highlighting a few as examples that might interest you in particular. But we can introduce you to all 150 during a meeting. Easily incorporate a mobile phone: Now you can be reached on your landline number worldwide. Multiple sites Set up any number of extensions with just one click. On hold Customers wait for the next available agent while listening to music or current sales offers. Virtual conference rooms. Have a team meeting by phone, even with 50 colleagues, employees and customers. Time controlled call routing - You determine who can reach you when and how – or your personal voicemail. NCTI Combine Outlook, Lync or CRM solutions for your telephony - available for MAC and Windows. 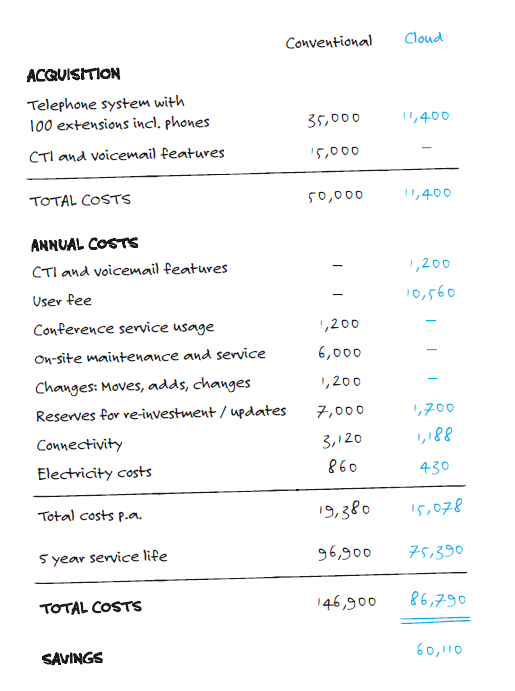 When parting from your old physical telephone system you also get rid of a lot of unnecessary costs at the same time. For example, no investment costs in hardware for your system apply. The only hardware you need are handsets and you can make use of your extra space. Billing is only calculated as per actual expenditure. You only pay for the number of extensions that you use on a monthly basis. And another positive financial influence for your accounts is all calls between your locations are free of charge, globally. In comparison to conventional telephone systems, you can save up to 50 % of costs overall. A point that is not only going to make your controller happy; you too can shine with this in your next meeting about telephone system solutions. We at ACT Systems offer a free survey with expert advice to deliver any size system - Including end user training and ongoing support to make sure your telephone system is always operational. Please get in contact with us at customerservices@actsystems.co.uk or 01189 870 070 to discuss further.